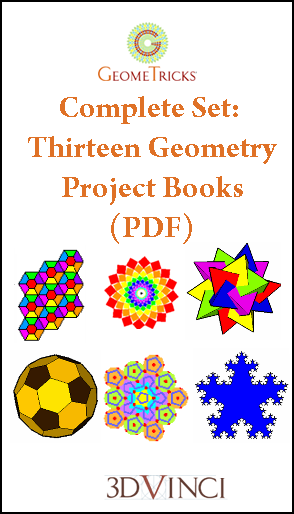 This bundled set of 13 GeomeTricks project books is great for math students, teachers, hobbyists, and anyone who agrees that geometry is cool! For both Mac and PC users, SketchUp Make 2014. All books delivered in printable PDF format, 8.5" x 11" size (US Letter). Download info will be sent within one business day. Purchased individually, all 13 books total $ 139.35, so get the bundle and SAVE!